Try the Light Visor | BioBrite, Inc. 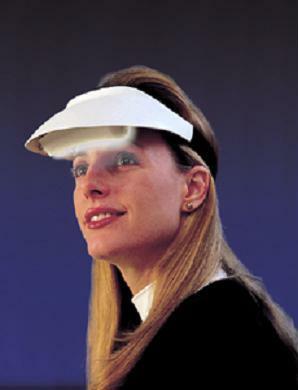 The Light Visor™ is a breakthrough in light use convenience and efficiency. The patented Light Visor gives you that critical light boost without putting your life on hold. It weighs only 5 ounces and fits comfortably on your head. Because it is powered by a rechargeable battery pack, which you can clip to your belt, the user is free to move about. You don’t have to sit still in front of a light box, you are free to move around and get things done. Eat your breakfast, read the morning paper, even exercise while the Visor gets your day off to a great start.The Light Visor™ delivers light from above the eyes, so it doesn’t obscure vision or interfere with normal activities. Importantly, the Visor is portable and convenient for travel. Shift workers, traveling businessmen and athletic teams all find the flexibility and ease of use of the Visor invaluable. For example, during four different Space Shuttle missions when many personnel were working irregular hours, light treatment was used to help them adjust . The professionals reported that using the Visor improved daytime sleep, and nighttime alertness on duty and reduced fatigue, and physical and emotional symptoms, compared to an untreated control group. Veterans experiencing PTSD sleep issues found measurable improvement in their symptoms when they used Visors at 10,000 lux for 30 minutes a day. Because they are relatively easy to use, non-addictive, and inexpensive compared to therapeutic alternatives, their use is expected to elicit less non-compliance, a critical problem with other therapies for PTSD.